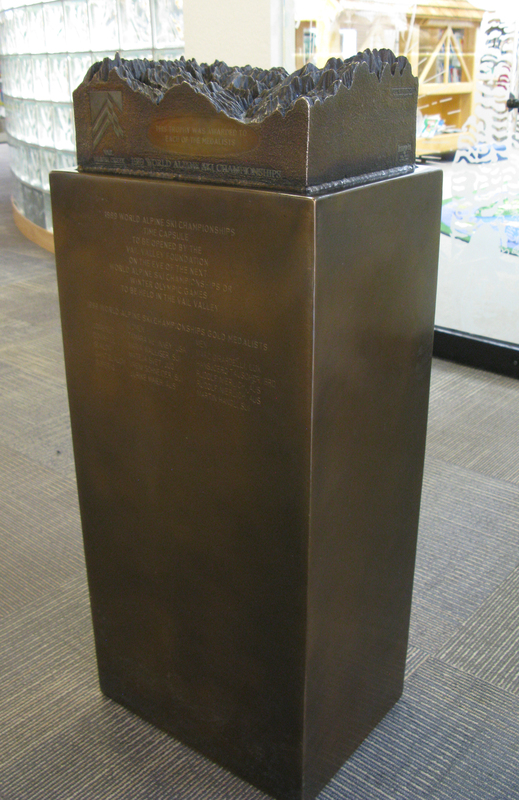 For the past 26 years, the bronze rectangular object has stood guard in a corner of the Vail Public Library, just inside the atrium, adorned with the trophy that was presented to the medal winners at the 1989 World Alpine Ski Championships. Vail’s 1989 World Championships time capsule (VVF photo). Over the years, the library’s daily guests may well have forgotten that this structure was actually a time capsule that the 1989 organizers assembled prior to the start of the Vail Valley’s first World Championships. Many may never have known that much about the bronze box. But on Tuesday, October 21, the public is invited to join with 2015 World Championships organizers and the Vail Town Council as they reveal the inner secrets of the 89 time capsule during a visit to the Vail Library in conjunction with the start of the Council’s regular work session at 1 p.m. The 1989 World Championships marked the first time in almost 40 years that the event had been hosted in the United States. A then record number of 42 nations were in attendance, represented by a total of 291 athletes. The 2015 World Championships will feature some 600 athletes from an estimated 70 nations.